New to investing... Some stocks pay dividends but I'm not sure how they might affect my portfolio or in which measure this is important when evaluating a stock. I also don't know how to figure out if and when dividends will be paid. Dividends are normally paid in cash, so don't generally affect your portfolio aside from a slight increase to 'cash'. You get a check for them, or your broker would deposit the funds into a money-market account for you. There is sometimes an option to re-invest dividends, See Westyfresh's answer regarding Dividend Re-Investment Plans. In general unless there's a big change in the landscape (such as in late 2008) most companies pay out about the same dividend each time, and changes to this are sometimes seen by some as 'indicators' of company health and such news can result in movement in the stock price. Now, in terms of telling when and how much of a dividend has been paid, most financial sites have the option when viewing a stock chart to show the dividend payments. If you expand the chart to show at least a year, you can see when and how much was paid in terms of dividends. For example you can see from this chart that MSFT pays dividends once a quarter, and used to pay out 13 cents, but recently changed to 16 cents. 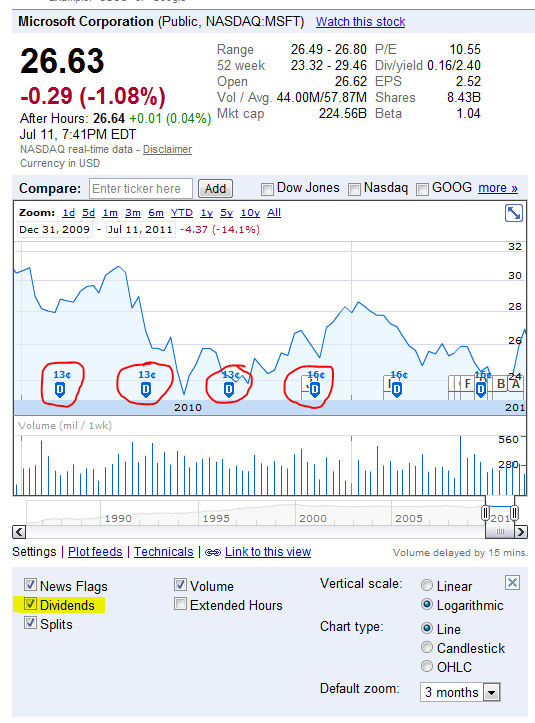 if you were to float your mouse over one of those icons it would also give the date the dividend was paid. Dividends are declared by the board of directors of a corporation on date A, to stock holders of record on date B (a later date). These stockholders then receive the declared dividend on date C, the so-called payment date. All of these dates are announced on the first (declaration) date. If there is no announcement, no dividend will be paid. The stock typically goes down in price by approximately the amount of the dividend on the date it "goes ex," but then moves in price to reflect other developments, including the possibility of another declaration/payment, three months hence. Dividends are important to some investors, especially those who live on the income. They are less important to investors who are out for capital gains (and who may prefer that the company reinvest its money to seek such gains instead of paying dividends). In actual fact, dividends are one component of "total" or overall return. The other component is capital gains, and the sum of the two represents your return. Dividends can also be automatically reinvested in your stock holding through a DRIP plan (see the wikipedia link for further details, wiki_DRIP). Rather than receiving the dividend money, you "buy" additional stock shares your with dividend money. The value in the DRIP strategy is twofold. 1) your number of shares increases without paying transaction fees, 2) you increase the value of your holding by increasing number of shares. In the end, the RIO can be quite substantial due to the law of compounding interest (though here in the form of dividends). Talk with your broker (brokerage service provider) to enroll your dividend receiving stocks in a DRIP. Stock dividend payments; how is payment made? How much taxes do corporations have to pay on dividends they receive from other companies?